FOM PhD researchers Fatemeh Jahani and Solmaz Torabi (working at the University of Groningen) have designed, synthesised and characterised a series of molecular semiconductors. For two new materials they can increase the dielectric constant. That is a first, important step towards improved organic solar cells. In organic solar cells, molecular semiconductors in the active layer of the cell convert the incoming light into electrical energy. This requires more steps than in inorganic semiconductors. That is bad news for the yield, which is one of the reasons why organic solar cells cannot compete with traditional solar cells based on silicon or gallium. Fortunately there is a theoretical, rigorous solution for the problem: the dielectric constant of new molecular materials should be increased to ten or higher. Then you approach the level of silicon that has a dielectric constant of eleven. Up until now that had been difficult to realise in practice but in 2014 scientists from the University of Groningen published their first experimental results about the increase of the dielectric constant. FOM PhD researcher Fatemeh Jahani designed and synthesised several series of new molecular semiconductors. Solmaz Torabi characterised these new materials. What was the outcome? The researchers could increase the dielectric constant of two new materials. They did that by introducing polar side groups in the molecular structure. Now it seems possible to overcome the first obstacle, producing molecular semiconductors with a higher dielectric constant. However, many more steps need to be taken: from materials with an even higher dielectric constant to improved solar cells and then to a clean and affordable solar cell technology. We introduce a synthetic strategy to obtain an increase of the dielectric constant of organic semiconductors. 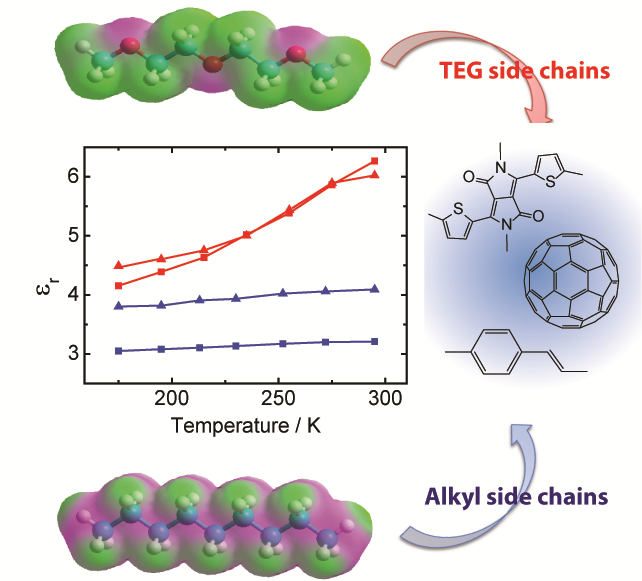 We can increase the dielectric constant significantly by adding TEG side chains to fullerene derivatives and conjugated polymers. Quantum chemical calculations show that this enhancement results from fast reorientation of permanent dipoles in the ethylene glycol units. This reorientation slows down at lower temperature.